The production of satirical prints was often the work of many hands rather than a single artist-engraver. In some instances a finished print may have been derived from an original drawing or painting by one person, engraved by a second and printed by a third, with a fourth person providing the funding required to make all this happen. All of these people could legitimately have expected to have their names added to the finished print in order to advertise their services and to ward of the threat of potential pirate editions being published by rivals. The need to add several names to the same plate meant that a system of labeling was required in order to make it clear who was responsible for what. This fairly typical example of Isaac Cruikshank’s work from 1790 for example, is marked with the signatures ‘Isaac delin’, ‘Jacobs fecit’ and that of S.W. Fores in the publication line. ‘Delin’ is an abbrevation of the latin term delineavit which (roughly) translates as ‘drew the lines’, while ‘fecit’ is also the latin for ‘made’. So we know that Jacob’s engraved the plate using a drawing that had been supplied by Isaac Cruikshank and that Fores paid for it all. Unfortunately the use of these marks was never standardised or enforced in the way that hallmarking was on metalwork. This means that the terms employed can vary depending on a print’s age, country of origin and the whims of its creators. Fortunately for the historian of print the good people at Virtuelles Kupferstichkabinett (Virtual Printroom) have drawn up a comprehensive guide to European print-markings used used between the late medieval period and the mid-nineteenth century. As you can imagine, it is far too long to reproduce here but I highly recommend that you click on the link HERE and save a copy for future use. Monumental Inscription on the Departed Minister!! This satirical broadside was offered up for auction a couple of weeks ago. It is not currently listed in the British Museum’s online catalogue but a number of other items in the Museum’s collection allow us to understand something of its provenance. It carries the publication line of John Fairburn, a map, book and printseller who was active in the City of London from the early 1790s until the early 1830s. Fairburn began his career by selling mezzotints in the manner of Carington Bowles before moving on to the publication of more conventional line-engraved satires around 1800. 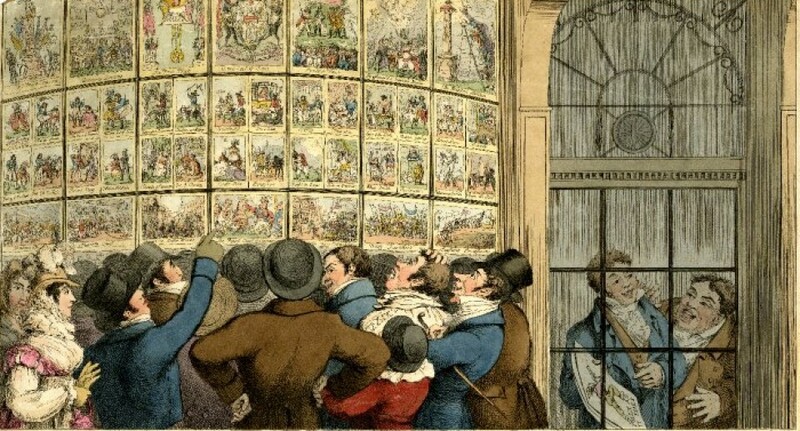 His output appears to have remained sporadic until 1819-20 when he began producing numerous satirical prints, handbills and illustrated pamphlets in response to the demand for news of the Queen Caroline affair. Surviving examples of his work suggest that his publications were dominated by political subjects and were usually, although not exclusively, anti-ministerial in tone. A tiny signature which appears in the bottom left-hand corner of the paper indicates that it was printed by the firm of D.S. Maurice, who were based in the Howford Buildings on Fenchurch Street. The image that appears at the top of the broadside can be firmly attributed to the hand of George Cruikshank. We know this because Cruikshank’s original sketch of the murder scene was among the items given to the British Museum by his widow in the late 1800s, and because a number of other versions of this image were published with Cruikshank’s signature on them. One of these was the frontispiece to a book entitled Life of the Right Hon. Spencer Perceval, Late Prime Minister of the Realm, which Fairburn had published shortly after the Prime Minister’s death in May 1812. What appears to have happened is that the publisher then reused Cruikshank’s plate as the header to a far less respectful euology to the late Prime Minister. 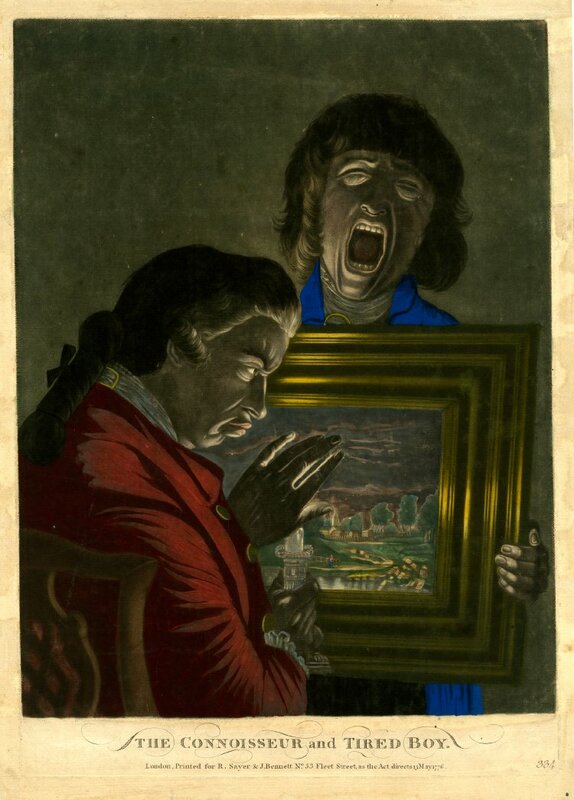 The print was possibly intended to act as part of a series of illustrated handbills attacking the conservative political establishment and may have been part of a series of handbills produced during 1812-13. See here and here for other examples of other prints which may have come from this series. Spencer Perceval was blasted into the beyond as he crossed the division lobby of the House of Commons on 11th May 1812. His killer was a deranged bankrupt who held the government responsible for for failing to extricate him from a Russian prison in which he’d languished from a number of years on trumped up charged. Unsurprisingly the assassination of a serving Prime Minister generated a huge amount of public interest and a number of publishers responded to this by commissioning prints, books and pamphlets on his life. These items were almost entirely conservative and highly respectful in nature, and Fairburn’s broadside is unusual in being one of the few prints to take an openly critical view of the dead Prime Minister. The fact that Fairburn used the same image in prints intended for audiences drawn from opposing ends of the political spectrum suggests that in this instance he was able to put his own political inclinations aside in the interest of making a quick profit.